Plural marriage • Effort to change bigamy's definition and stiffen penalties in some circumstances passes at 11th hour. Steve Griffin / The Salt Lake Tribune Polygamist Joe Darger, center, listens as Rep. Mike Noel, R-Kanab, left, present HB99 to members of the House Judiciary Standing Committee in the House Building Room 20 on Capitol Hill in Salt Lake City Wednesday February 1, 2017. HB99 clarifies polygamy is a felony in Utah. Steve Griffin / The Salt Lake Tribune Rep. Mike Noel, R-Kanab, center front, sponsor of HB99, has his witnesses sworn in as he presents the bill the clarifies polygamy is a felony in Utah, to members of the House Judiciary Standing Committee in the House Building Room 20 on Capitol Hill in Salt Lake City Wednesday February 1, 2017. 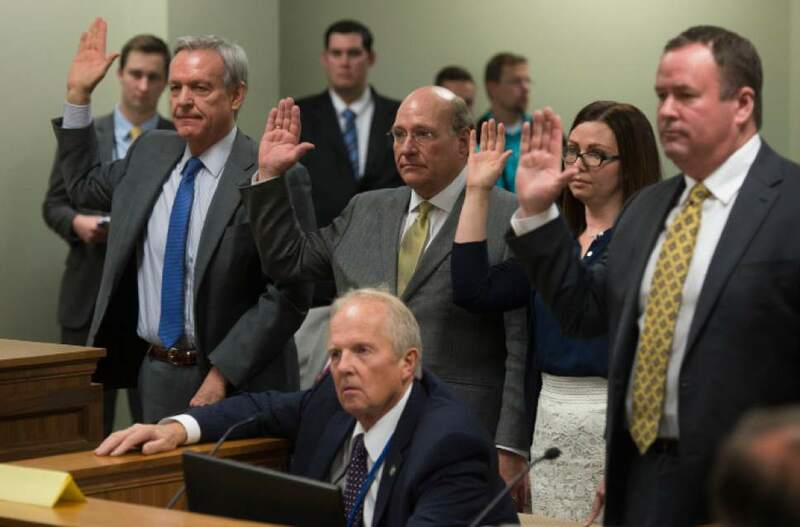 A bill that would change the definition of polygamy and increases the penalties for it in some circumstances passed the Utah Legislature in the session&apos;s final minutes. The bill never received a hearing in the Senate, but it was brought to the Senate floor for a vote and passed 15-14. It will go to Gov. Gary Herbert for his signature or veto. HB99 would add criteria for being prosecuted for bigamy: The offender would have to live with the extra spouse and "purport" to be married. State law requires only one or the other. Bigamy would remain punishable by up to five years in prison, but the penalties could increase to 15 years if the offender is convicted in concert with crimes such as fraud, abuse or human smuggling.